When you unpack a new lathe - whether it's a bench top or freestanding model - the enclosed manual doesn't venture much beyond basic safety, assembly, and set-up. That leaves some head-scratching when it's time to fire it up and start turning. Where's the manual that covers all the things your new lathe is designed to do? 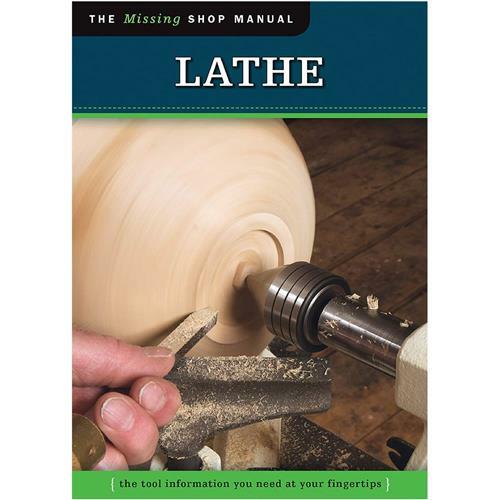 The Missing Shop Manual-Lathe takes that next step with you. In addition to explaining the basics of safety and set-up, this handy reference will help you get the most for your money by getting the most from your equipment. From sharpening your tools to faceplate, bowl, and spindle turning, you'll discover the techniques and tips you need to maximize your lathe's performance. Even if you've been woodturning for years, you'll wish this was the manual that originally came with your new lathe. Softcover, 152 pages. Very handy book I keep close to my lathe. Good price too. Clear and concise text for a beginner. I built the lathe stand in the book for my 'old iron' Montgomery Wards lathe, worked very well.